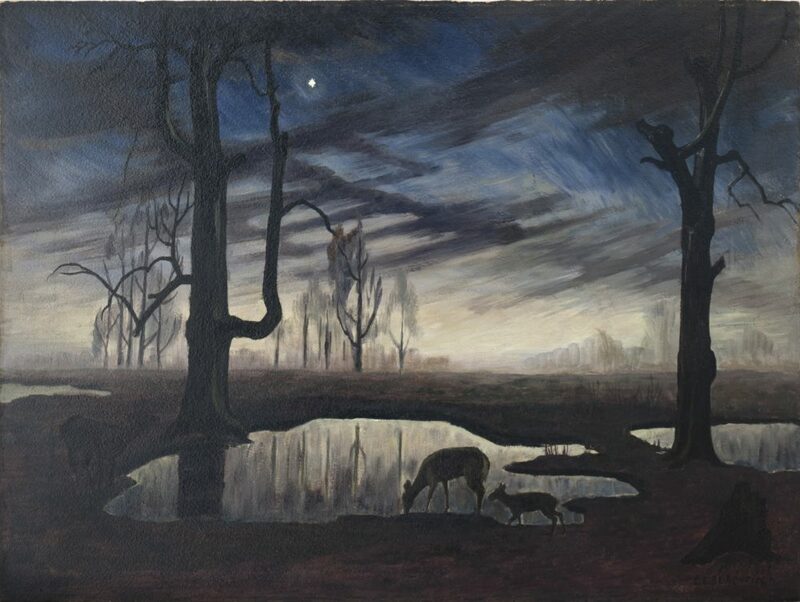 Charles E. Burchfield (1893-1967), The Evening Star, 1923-1926, oil on board, 20 3/8 x 27 1/2 inches, The Charles Rand Penney Collection of Works by Charles E. Burchfield. Artist Charles Burchfield has been called one of the great American masters of the 20th century. A watercolorist, he used the night sky as inspiration for the work that is part of “Charles E. Burchfield: Oh My Heavens” opening at the Hillstrom Museum of Art on November 19. The opening reception will be held from 7-9 p.m. on November 19 in the museum and will give visitors the chance to see the exhibit and speak with Hillstrom Museum of Art Director Donald Myers ’83. There will be an additional gallery talk from 3-4 p.m. on January 20, 2019, featuring Tullis Johnson, curator at the Burchfield Penney Art Center in New York. An expert on Burchfield and his work, Johnson’s talk, entitled “And the Heavens Opened: The Heavenly Art of Charles E. Burchfield” discusses the exhibit, including its conception and some of the works included. Myers says the exhibit was selected because the museum’s namesake, Richard L. Hillstrom, had a deep appreciation for the work of Burchfield. In fact, he owned two of Burchfield’s works, when the rest of his personal collection typically contained only one piece from most other artists. Myers says Burchfield’s work is unique because it shows a kind of “ecstatic poetry” and he is known for his visionary landscapes in watercolor. “The works often seem to crackle with an electrical sort of presence that could be seen as the divine and that show his deep reverence for the natural world,” he says. The exhibit features 50 of Burchfield’s watercolor paintings of the sky, moon, planets, and stars, along with three pieces belonging to the Hillstrom collection. Gustavus Adolphus College is the first stop of this new traveling exhibit. The museum received a grant of $12,000 from the Carl and Verna Schmidt Foundation and $1,000 from the St. Peter Chamber of Commerce Tourism and Visitors Bureau to help defray the costs of this exhibit. “Charles E. Burchfield: Oh My Heavens” is on display November 19–February 1 at the Hillstrom Museum of Art. The museum is free of charge and open 9 a.m.–4 p.m. Monday through Friday and 1 p.m.­–5 p.m. Saturday and Sunday.